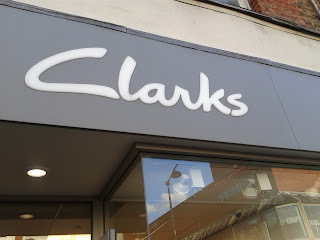 I never made a secret of the fact that I thought Clarks got it very wrong with their pre-shoes range. In fact Aaron had three pairs of Pre Shoes which I much preferred. Having taught yoga for 6 years and having worked in the wellbeing footwear world also for 6 years, I am fussy about Aaron's footwear, and feet. Despite not being a fan of Clarks in the pre shoe stage, all but one of his shoes since then have been Clarks. Just one time, we were in Covent Garden and couldn't find a Clarks so his shoes that time were Skechers (which ironically were not any cheaper). Anyway for the last 6 months Aaron has lived in sandals (Clarks' Doodles to be precise and I love them!) - I had him in sandals last Summer too (also Clarks' Doodles) - with socks on nippy days and barefoot on hot days. But yesterday, (i), the weather is changing and (ii), his toes were at the very edge and EVEN MORE SO as I had socks on him yesterday which seemed to make his sandals look way too small. Now thanks to this you tube video (that I watched a while back) I knew all about shoes BENDING in the wrong part of the shoe, which is exactly what the fur trimmed one on the middle row, second from the left does. Don't touch it - we did not even try it on for that reason. the ones on the left in the top row, but they looked like clown shoes when they were on. The ones in the bottom row, second from the left. Despite the dinosaurs it was THOSE that Aaron and I loved. They are called HARKLIN HI and they are "khaki leather". They were a STOMPING £36 and last year his winter boots (also from Clarks) were £34 (that's inflation for you). Aaron is a massive 9 G, which I am told is big for a 2 year old (he is only 27 months). Anyway, he looked comfortable in them straight away. (1) they have a distressed look so looked normal immediately (2) they 100% go with his cool dude style of dressing (3) he did not need to wear them in and was running and walking (and on slides and swings all evening in Ally Pally) and (4) baby AND Mummy loves them! Result! Don't love the price tag though. They have a great electronic machine now for measuring, that you stand in, but it did not work for Aaron so they measured him manually and I love it as they measure width too. This is the poster they now have in store, which sums up what they offer. This is the first time I was served by a GREAT sales assistant - was very happy with her. I'm glad you wrote that they cost 36 pounds as I always feel that children's shoes are so overpriced here. However, it seems that the price is about the same. shame it wasn't sponsored though. Yes, expensive, but then the Skechers ones were £30 (I dug out the receipt since writing) so they all seem to be dear. Yes, I don't seem to get sent product to review for some reason. Did you know you can get "last seasons" clarks shoes at the website "shoes for kids". Obviously it means you can't try them on before you buy but they are significantly cheaper. 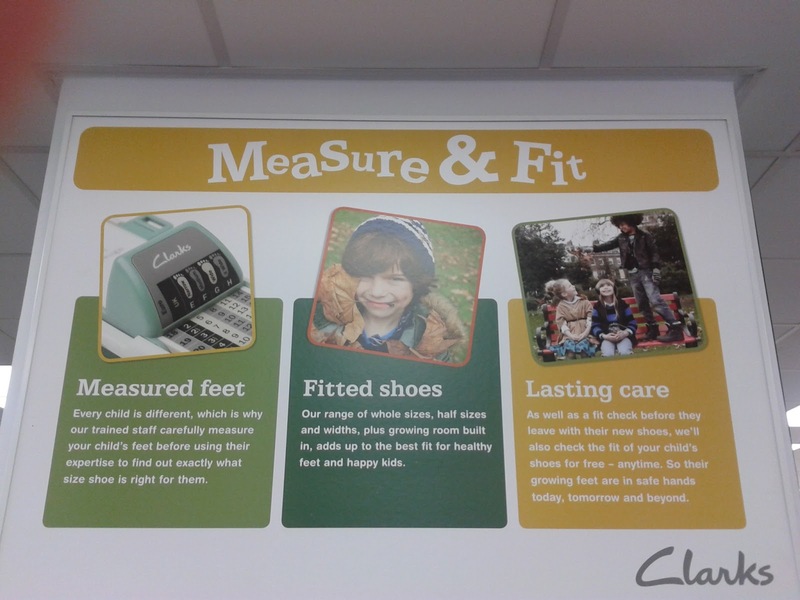 That's where we get all goblins shoes after taking him to the shop to get them measured. 9g is big for 27 months. Goblin is a 9H at 35 months and everyone bawlks at that. I WILL check that website out - thank you for letting me know. I had come across the 'shoes for kids' website a few years ago but had forgotten all about it so thanks for the reminder! My little boy is 3 and a whopping 10.5 G and I have trouble finding him cute little boy shoes instead of black school shoes which is all our local Clarks ever have in his size. Great post! I'm looking for the right shoes for my son and I decided to ask my sister to help me. 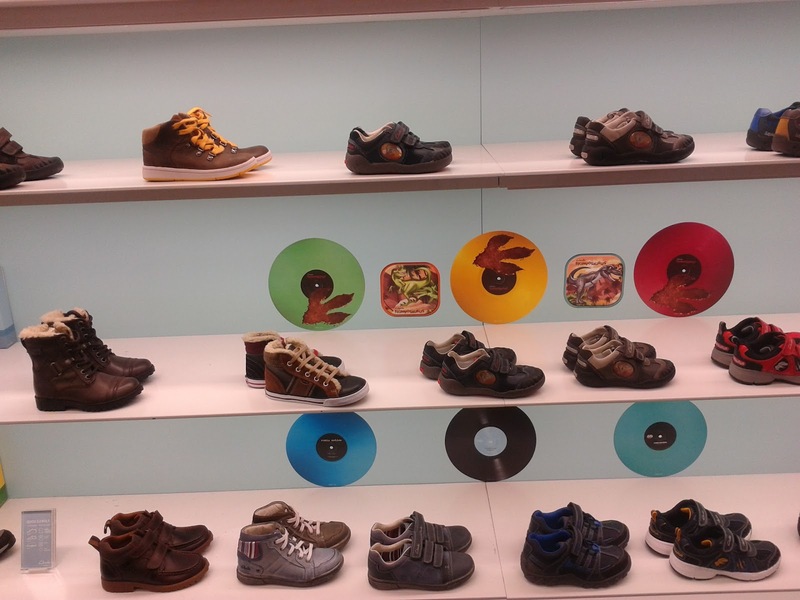 Yesterday, she shared your blog with me and after I read your blog, I decided where should I buy the right shoes for my son. Thank you for sharing!. These are perfect footwear amid weddings and social gatherings Havaianas Slim for an increasingly cleaned and formal look.